Isagenix Harvest Thins £ £15.00In stock! Order now! Get ready for tasty plant-based snacking with our Thai Sweet Chilli flavoured Harvest Thins. These delicious snacks pack a crunchy and savory flavour. They’re the perfect blend of sweet and spicy, formulated from our signature plant-based protein sources. Each serving size is only 100 calories and contains 11 grams of Isagenix plant-based pea protein. Each box contains 10 individual sachets/packets. Isagenix Harvest Thins support weight loss and lean muscle maintenance with their high-quality protein blend that helps keep you feeling fuller longer. They are gluten-free, approved for Cleanse Days and conveniently portioned into 100 calorie snack packs that are easy to take with you for snacking on the go. These scrumptious snacks promote sustained nourishment within your system while continuing to support weight loss and the building of lean muscle. Just like Isagenix Shakes, these snacks contain a powerful combination of protein, healthy fats, and carbohydrates that will help you achieve your weight-loss goals without ever feeling hungry. 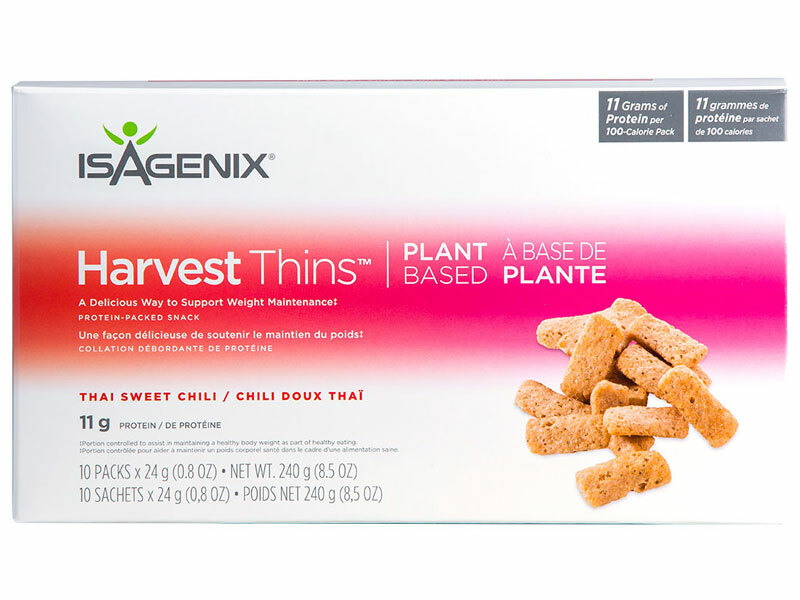 Harvest Thins are a great supplemental Isagenix product for those seeking convenient snacking and appetite control throughout the day. Harvest Thins are kosher, have a low glycemic index, and are soy and gluten-free to appeal to a wider customer base, including those with food sensitivities. Click here for more information or to purchase these delicious Harvest Thin snacks. If you want to make the most out of every single workout and perform at your peak, purchase Isagenix Harvest Thins directly from us. All products are shipped from the local distribution centre in London or other parts of Europe, right to your door in no time at all. If you live in Europe, it’s time to join the Isagenix revolution and take your performance to a whole new level! How Much Are Isagenix Harvest Thins? Each box (containing 10 individual sachets/packets) can be purchased for £20 at full retail prices, or sign up with us and pay just £15.00 per canister. Read Isagenix Harvest Thins reviews from real Isagenix UK customers!